The Calendar page shows the employer-wide calendar, encompassing the events for all active employees. 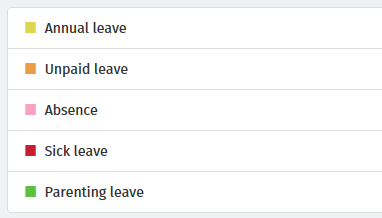 As leave is added for employees within the employer file in BrightPay, these updates will be reflected here after the data synchronises to BrightPay Connect. 1) Use the 'previous' and 'next' navigation buttons at the top right of the calendar to move forwards and backwards in the year. 2) Hover your mouse over a day on the calendar to see a summary of what's happening on that date. Dates with multiple types of events are striped with the relevant colours. To see the breakdown, simply move your mouse over the date.